TDK LTO Universal Cleaning Cartridge. 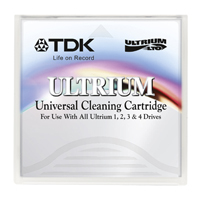 The TDK Life on Record LTO Ultrium Cleaning Cartridge helps optimize performance and protects your hardware investment. It's compatible with all LTO Ultrium 6, 5, 4, 3, 2 and 1 hardware. In some LTO Ultrium 1 drives, UCC firmware installation may be required.